CARNIVAL 2019 is a celebration of the CINCO DE MAYO. Come and enjoy the rides, laughter, fun and of course the wonderful FUNNEL CAKE! Thursday, May 2, 2019 through Sunday, May 5, 2019, located in the VILLAGE OF HAVERSTRAW at W. Broad Street, Haverstraw, New York 10927. Our club enjoys delivering dictionaries to all the 5th graders in North Rockland! 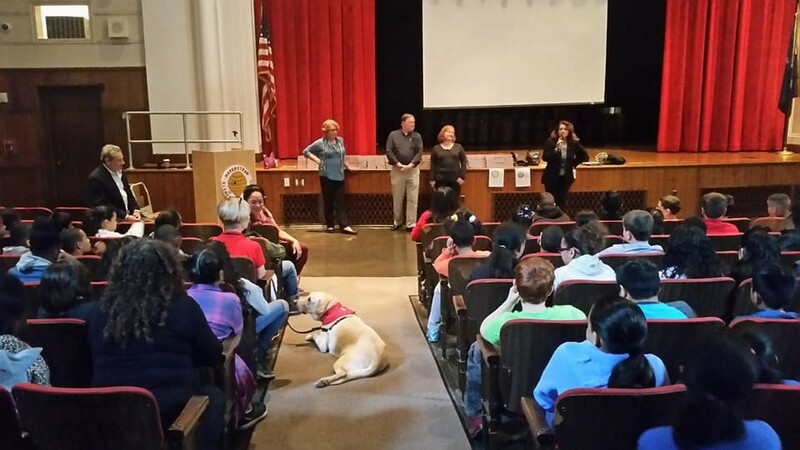 We read to their special "dog" and he enjoyed hearing that there are over 1.2 million rotarians in over 200 hundred countries. DICTIONARY DELIVERY 2017 2017-11-02 04:00:00Z 0 Our club enjoys delivering dictionaries to all the 5th graders in North Rockland! We read to their special "dog" and he enjoyed hearing that there are over 1.2 million rotarians in over 200 hundred countries. 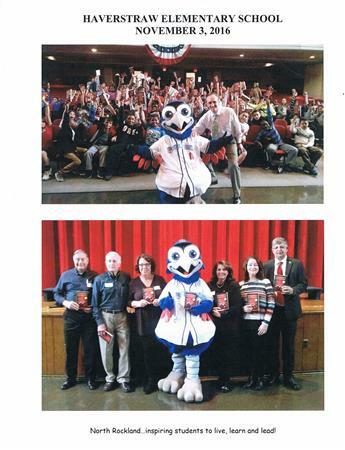 The delivery of dictionaries in the North Rockland Central School District is an event to attend! The excitement and gratitude from the students is a day of fulfillment and joy for the members of the Rotary Club of North Rockland. Of course, Boulder Bird having signed each and every one of the children's books leaves the children with a great day to remember their "great" book! 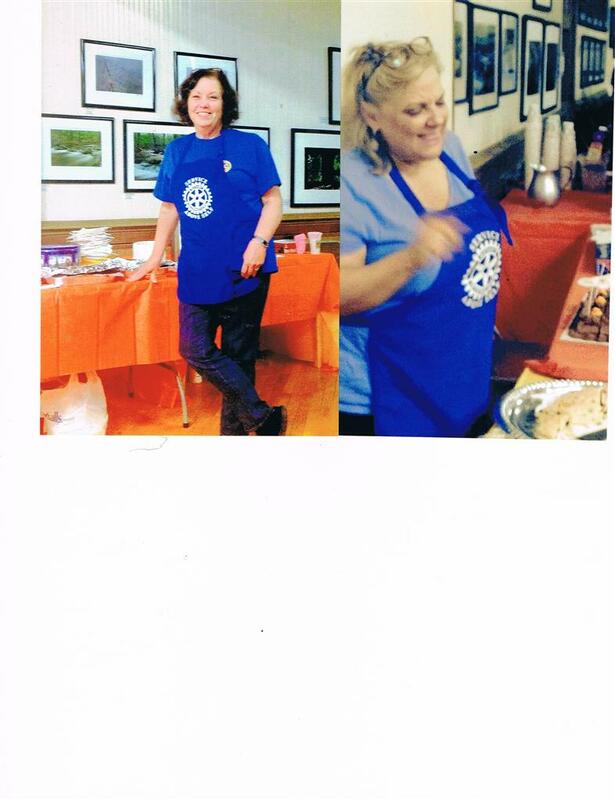 On Wednesday, June 24th, 2015, the North Rockland Rotary will say good-bye to President Altea Gonnella and install a new President, Doreen Makara, and her new Rotary Board. These Rotarians will lead the organization with the Rotary International theme of “BE A Gift To The World”. Rotarians around the world foster peace in many ways and work both internationally and in their local community to bring health, safety and human dignity to the communities they serve. The Rotarian motto is Service Above Self and, through service, people become more tolerant of their differences. As to the history concerning women in Rotary, it was only in 1990 that Rotary voted to appoint its first female President of Rotary International. The struggle to permit women into Rotary ended on May 4, 1987 when the United States Supreme Court held that they could not exclude women from membership based upon gender. In 1994, the North Rockland Rotary had its first women President, Pat Gordon and several women have since served as President. Rotary is a global network of community volunteers and it is the largest and most influential international humanitarian service organizations worldwide. Founded in Chicago on February 23, 1905, today over 1.2 million members belong to 33,000 Rotary clubs in more than 200 countries and geographical areas. It is “ Be a Gift to The World” that will lead the way this year for all Rotarians around the world. 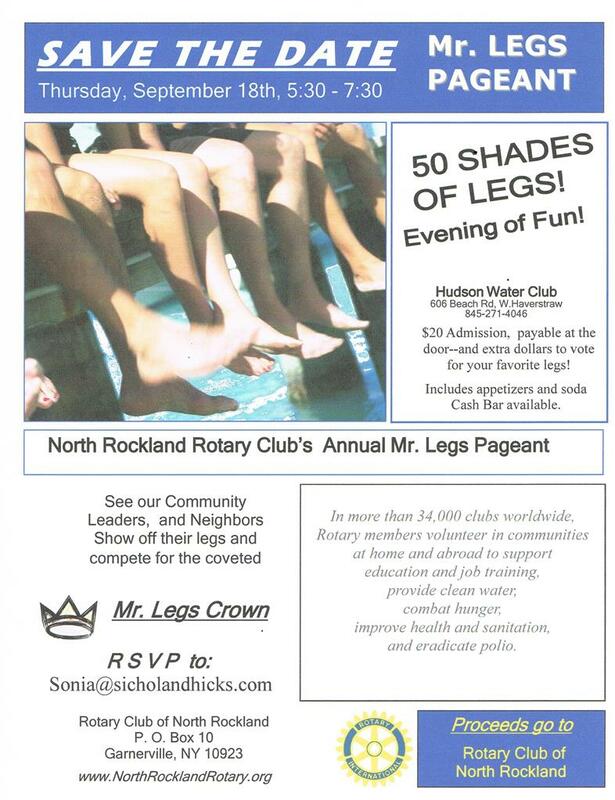 For more information about ROTARY contact Doreen Makara, President of the North Rockland Rotary at P.O. Box 10, Garnerville, NY 10923, or at Dmakara@mtb.com or (845) 354-6009. 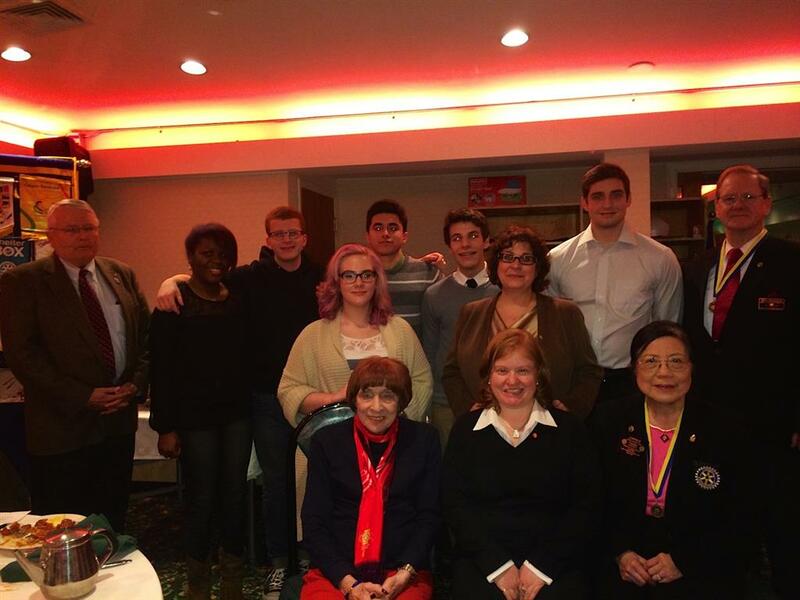 North Rockland Interact Club for 2014-2015 Co-Presidents and Officers were inducted by Tom Zugibe. 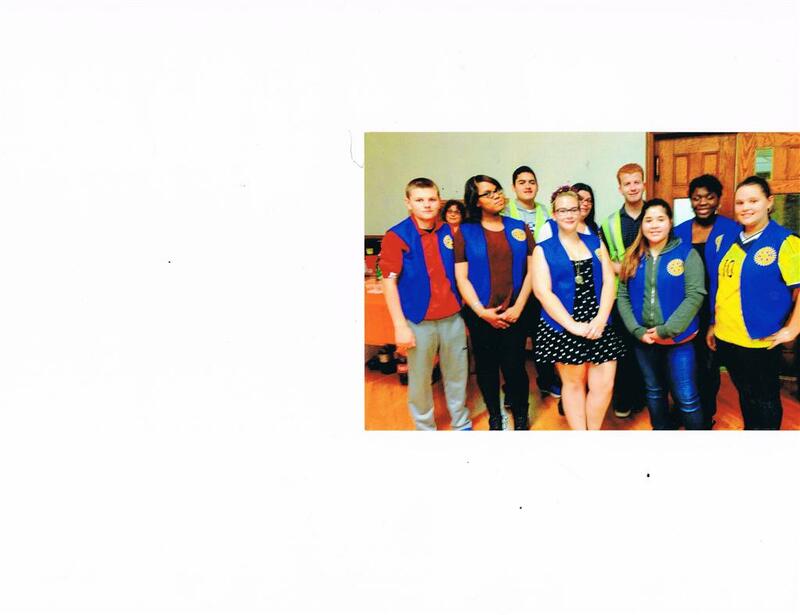 North Rockland Interact Club which conducted a blood drive to benefit 500-600 people, is one of the most successful clubs in the metro area. They were honored at Yankee Stadium on June 4. 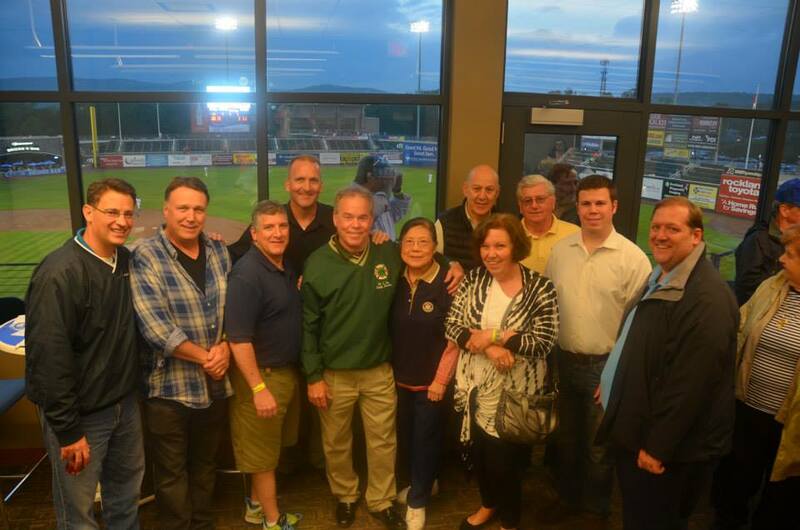 North Rockland Rotary President's Party was held on May 23, Boulders 2014 season opening day, at Provident Bank Park, and attended by many families and guests. North Rockland Rotary family photo with Rockland County Executive Ed Day. 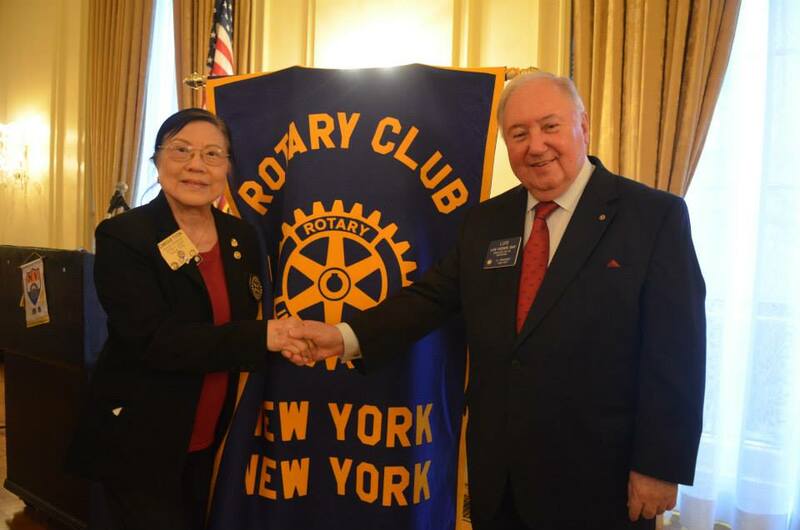 PDG Carole Tjoa joined New York Rotarians in welcoming Past RI President Luis Giay and RI Director Celia Giay to New York. 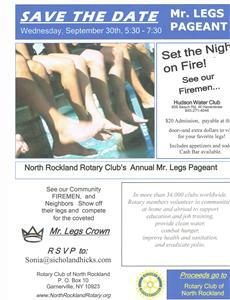 Rotary Club of North Rockland turned 88 on May 1, 2014. 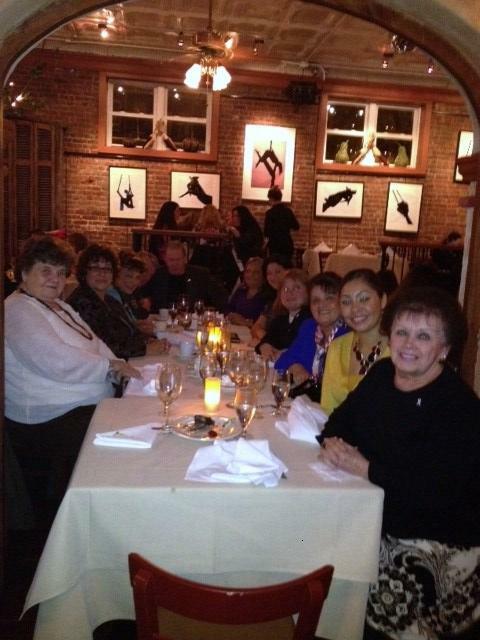 A celebration dinner was held at Lynch's Restaurant, Stony Point. 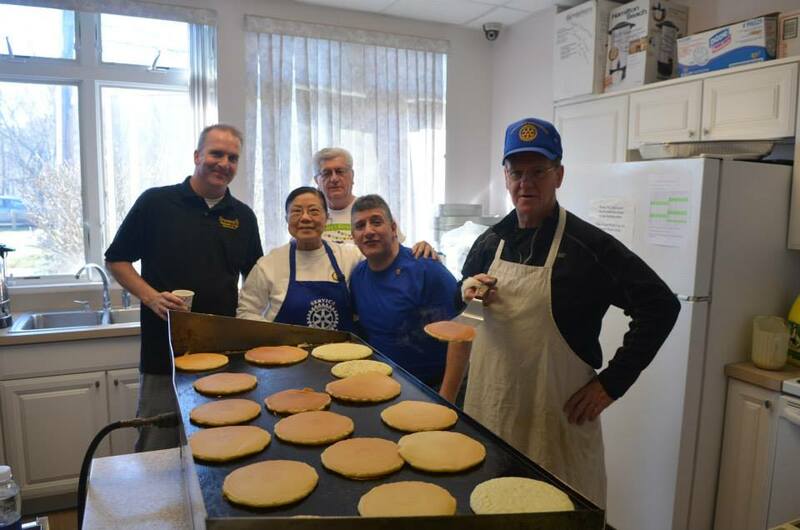 Our annual pancake breakfast, chaired by Frank Phillips, was held on Sunday, April 6, at West Haverstraw Community Center. Funds raised will go towards an additional scholarship for a college-bound high school graduate. AG "Bud" Wassmer and PDG Carole Tjoa welcome Morgan Stanley Financial Advisor Dennis Ryan (center) to membership in North Rockland Rotary. North Rockland Rotary distributed coats to children in Stony Point, Haverstraw, West Haverstraw, and Thiells elementary schools during one of the coldest weeks on record. Bud Wassmer and PDG Carole Tjoa inspect Operation Warm coats. Hon. Member Patricia Zippilli accepted North Rockland Rotary donation check for St. Peter's Food Pantry in Haverstraw. District Governor Drew Kessler, visiting Home Club on October 31, 2013, was welcomed by fellow Club members, led by Queen of Hearts and Halloween Witch. 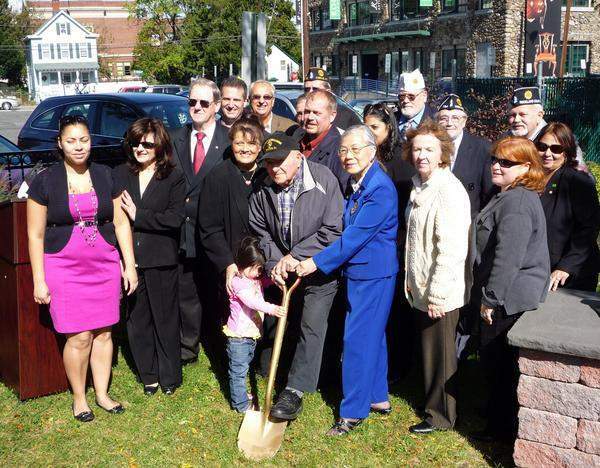 Congratulations to Stony Point Supervisor Geoffrey Finn, Sons of the American Revolution, and North Rockland Rotarians on the dedication of the Patriots Monument and the Rotary Clock on October 12, 2013. 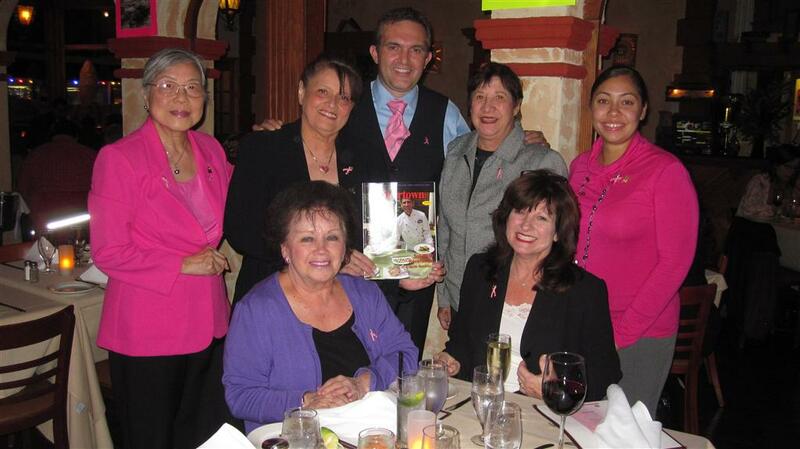 Cancer Awareness Dinner on October 9, 2013, was hosted by Kathy Vandervoort at Union Restaurant, Haverstraw. 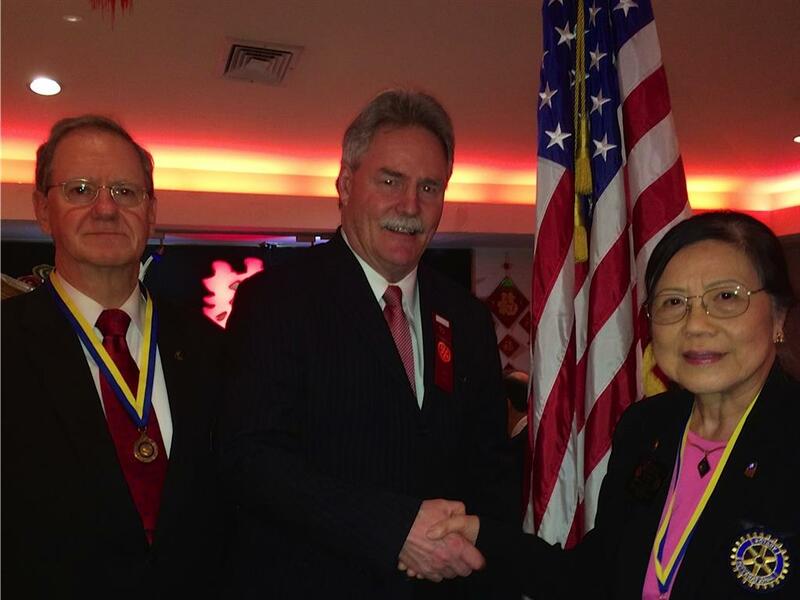 PDG Carole Tjoa attended a reception to benefit the Ronald McDonald House New York, hosted by Rotary Club of New York on October 3, 2013. The Congers-Valley Cottage Rotary Club's Italian Festival was held on September 29, 2013 at Congers Station Park. The Haverstraw Street Fair, held on September 22, 2013, brought together families and world cultures. 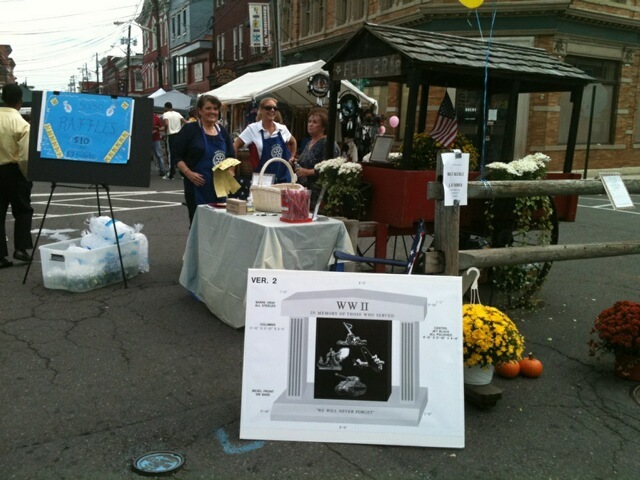 The club participates each year in the Haverstraw Annual Street Fair. The North Rockland Rotary took some time to have fun together as a group. We took a bus trip up to the beautiful Brotherhood Winery in Washingtonvile, NY. A great time was had by all. North Rockland Rotarians, inspired by Rotarian Sonia Crannage, collected and donated baskets of dearly needed supplies and money to the Rockland Family Shelter. The Rockland Family Shelter is the only agency in Rockland County that serves victims of domestic violence and their children. The NR Rotary collected food from the membership throughout the month of November for Catholic Charities in Haverstraw. We also gave Shop Rite Gift Cards so that they can complete their Thanksgiving meals for families in need. The women at the food pantry were truly overwhelmed with our donation and were very grateful. 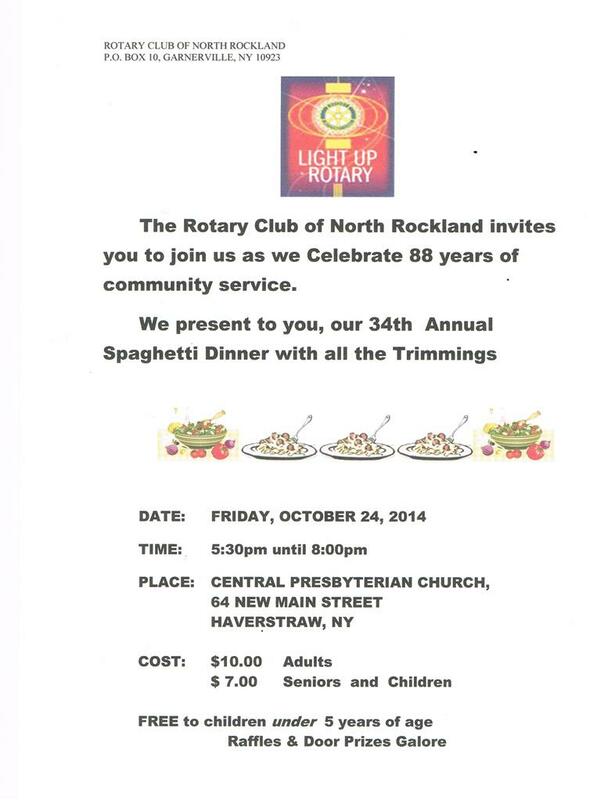 On Friday, October 30th The North Rockland Rotary had its annual Presidents Party. This year we had our first ever Halloween Costume Party. Great Fellowship was had by all!!!! The members of the NR Rotary collected unwrapped toys for the Salvation Army to distribute to children in need. They also collected children's books to stock the Little Red Bookshelf at the Central Presbyterian Church Day Care. Pat Gordon has sponsored our newest member Steven Greh who comes to us from Truscto Bank. Welcome Steve! DG Jeffrey came to inspire our club and set our new goals for the year. He reminded us of our duties as Rotarians and how our efforts not only impact the North Rockland community, but the world at large. North Rockland Rotary Inducted their newest member Peter McGuire. He was sponsored by Gary Mower. Peter is not only President of Hush Electric, but is also a fireman in the Bronx. He is very active within the NorthRockland/Haverstraw community. Welcome Pete! 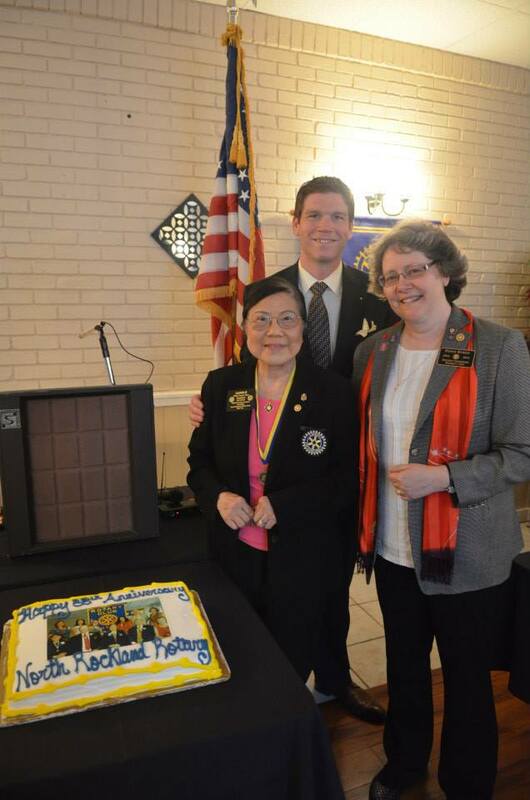 DG Jeffrey Keahon & PDG Carole Tjoa joined Club President Nick Longo in inducting our newest member, Liz Brady. Liz comes to us from Edward Jones Investments and was sponsored by Tracy Marshall. Welcome Liz! Sonia Crannage delivered a great presentation to the club on her experience at the International Conference and the End Polio Now Campaign. We installed our new President, Nicholas Longo, Sr. along with his new Executive Board. North Rockland Rotary Serves Food to the Homeless with Helping Hands. Spaghetti Dinner 2014 Fun Event! 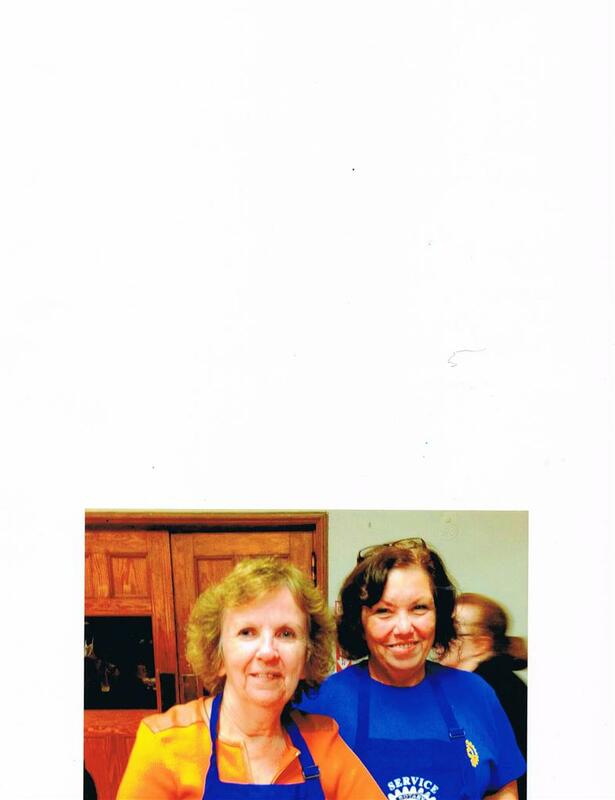 Wonderful memories were captured during our 34th Annual Fundraising Spaghetti Dinner held on Friday, October 24, 2014, at the Central Presbyterian Church in Haverstraw, New York. The community sponsors and the community at large came out to support our fundraising event. 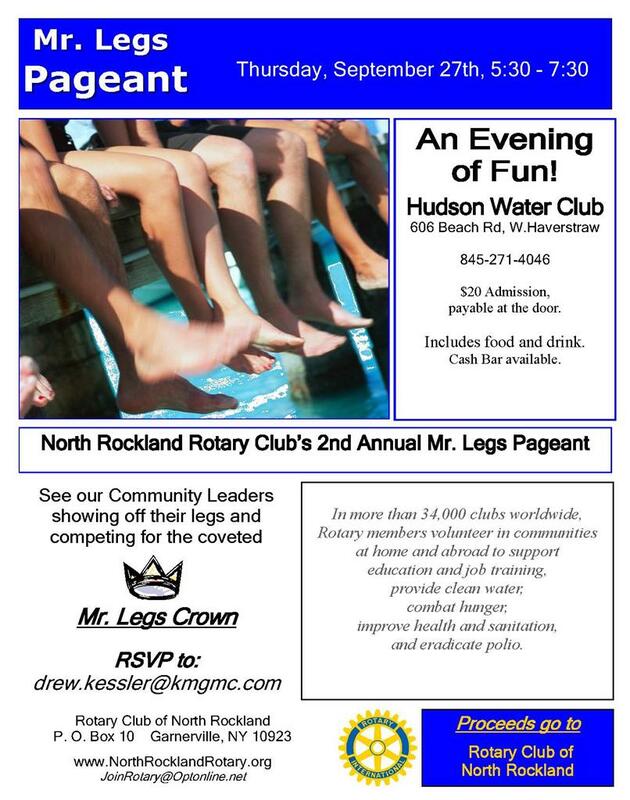 The success of the dinner allows our club to establish Rotary Scholarships to graduates of the North Rockland High School. All of our members worked very hard to bring this dinner with all its trimmings to North Rockland. We thank our entire community and sponsors for all their help. On one of the coldest nights on record, North Rockland Rotarians prepared and served a hot meal to the needy at St. Peter's Church in Haverstraw. L - R: Paul Piperato, John MacDonald, Kathy Vandervoort, Mary Halstead, Bud Wassmer, Carole Tjoa, Eileen Lima, Gary Mower. Peggy Koval accepted a donation for a senior prom and celebrity fashion show to be held. From left: PDG Carole Tjoa, Past President Bud Wassmer, Peggy Koval, and Dina Nejman. Barbara Matone of Stony Point Seals expressed appreciation for North Rockland Rotary donation to support their fund-raiser plunge in the Hudson River to help a sick little girl. Meals on Wheels C.E.O. 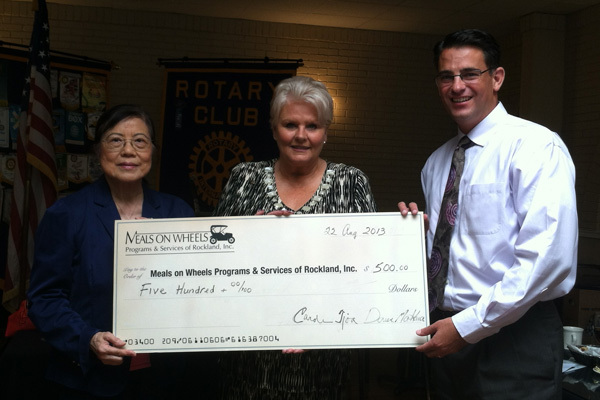 Barbara Kohlhausen accepted a North Rockland Rotary donation from PDG Carole Tjoa and Rotarian Ralph Travaglini of Meals on Wheels Board of Directors. 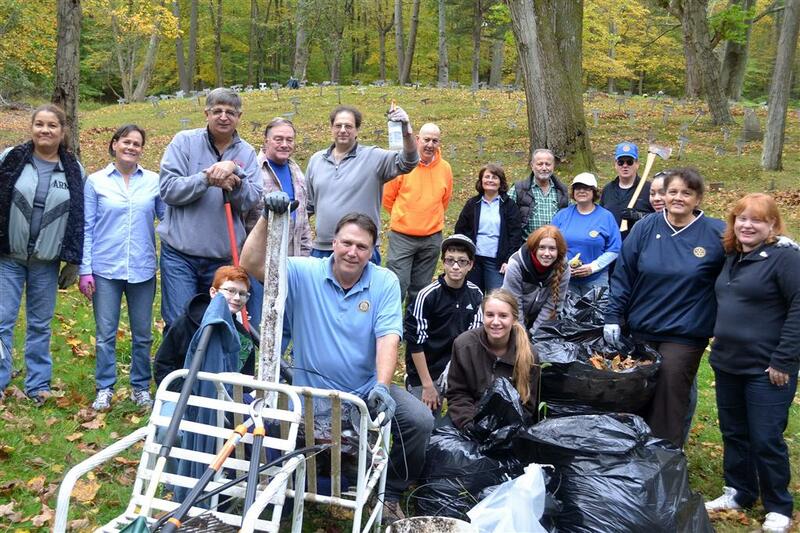 The Old Letchworth Village Cemetery 1914-1967 was cleaned up by the Rotary Club of North Rockland members on Sunday, October 14, 2012. The theme of the day was for "Those Who Shall Not Be Forgotten". Those words were inscribed on a bronze plaque that was placed on a large granite memorial. A list of names of individuals who were buried at this cemetery are neatly listed, but no one knows exactly where they are buried. Our job was to clear the debris and clean the memorial site so that anyone who wants to visit can read the names of the individuals and walk safely throughout the cemetery. The day was a day of honor for our club and those that attended created a lifetime memory. A very big thank you to our rotarian, Dina Nejman, for leading the way! Continuing Rotary’s 100 plus years of community service, the Rotary Club of North Rockland plans to distribute over 30 new winter coats to needy children – through the Operation Warm coat drive. The new coats will be distributed through the North Rockland Schools. A winter coat is an essential item in New York. A new coat provides more than just warmth, it allows a child to attend school, where they not only receive an education, but they also receive meals. A new coat provides the added benefit of increasing self esteem and who doesn’t like getting new things? Coats will be distributed by the Rotarians sponsoring the program in early November, 2012. The Rotary is working with Operation Warm Inc., a non-profit charitable organization dedicated to distributing high quality, new winter coats to children living in need. North Rockland Rotarians have announced to the Board of the North Rockland School District, that they would be donating and distributing over 1,000 dictionaries to each and every FIFTH grade student and their teachers. The Rotarians will also be providing Spanish/English dictionaries to the various classes in need of the same. The Dictionaries were paid for by the North Rockland Rotary Club through their fund-raising efforts. The Rotarian four-way test had been inserted inside each dictionary. The President of the North Rockland Rotary, Sonia Burgos Crannage, Esq. , together with a committee of Rotarians provide a program in the school informing the children of the significance of the four way test. The Rotarians share their favorite “words” with the students and the students share some of their favorite “words” with the Rotarians. For many North Rockland children, it is the first book they can truly call their own. 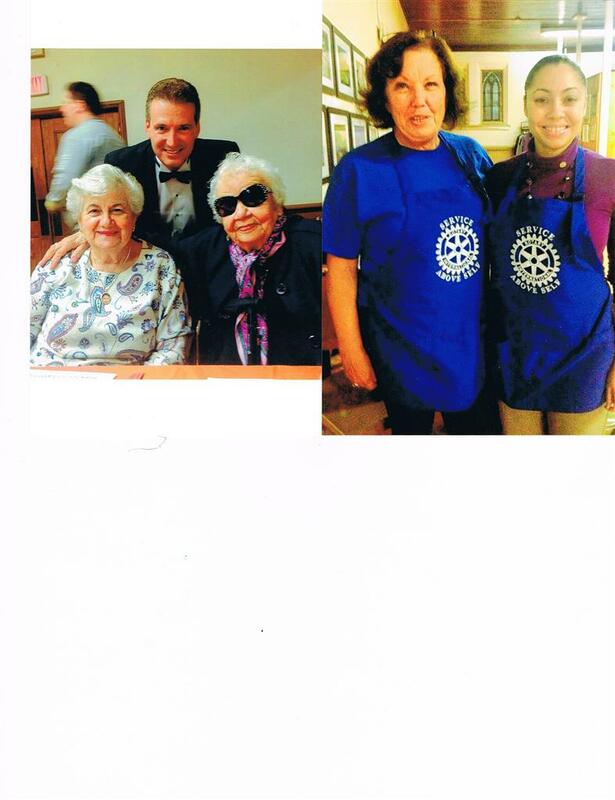 For the North Rockland Rotary it is one of the most rewarding experiences of the club. President, Sonia Burgo Crannage, attended the Annual Benefit Brunch at the Crowne Plaza, Suffern, New York, on Sunday, October 21, 2012. The Rotary Club of North Rockland made a contribution to the museum by taking out a journal ad to congratulate the honorees. It was a wonderful event with a great educational program about the museum's work. A program like this has many corporate sponsors, but what makes the event a great success is the community itself coming out in support of this great organization. Attending the event was one of our own rotarian member, Doreen Makara, representing M&T Bank who was one of the corporate sponsors. During the program we had an opportunity to view and hear some of the testimonials of the survivors of the holocaust. The stories were rivoting and overwhelming and we were all filled with great emotions. The testimonials of the survivors is a major project of the museum and we had a first-hand opportunity to preview this historical undertaking. It was an honor to have had the opportunity to attend this program on behalf of our club. October is fight against breast cancer month. Several of the North Rockland Rotarians and friends participated in a fellowship evening of dining together at Union Restaurant, Haverstraw, New York as a fundraising contribution for the fight against this debilitating condition. Union Restaurant is raising money every Wednesday evening during the month of October towards the fight against breast cancer. As Rotarians we were a part of the “Pink” evening and we wore our pink pins with pride in support of this campaign. Our miniature clocks have arrrived! We can begin our efforts to raise the funds for the Stony Point Community Clock and remember our opening day ceremony is Veterans day. You can download a Stony Point Clock "flyer" to help you share the information necessary to purchase the miniature clock and obtain donations from our community, family and friends. 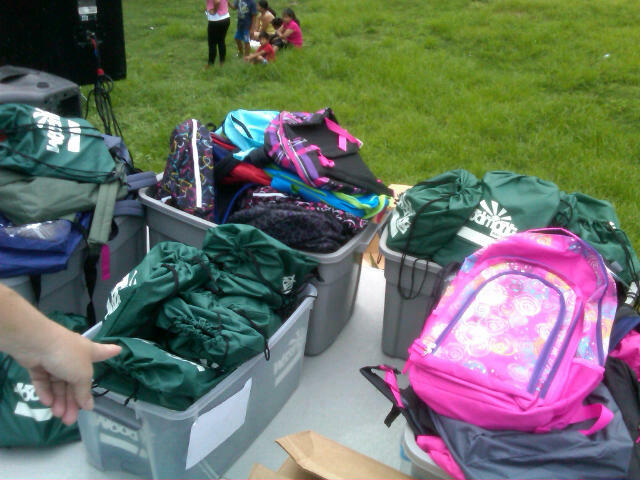 SCHOOL BACKPACK PROGRAM 2012 A SUCCESS! 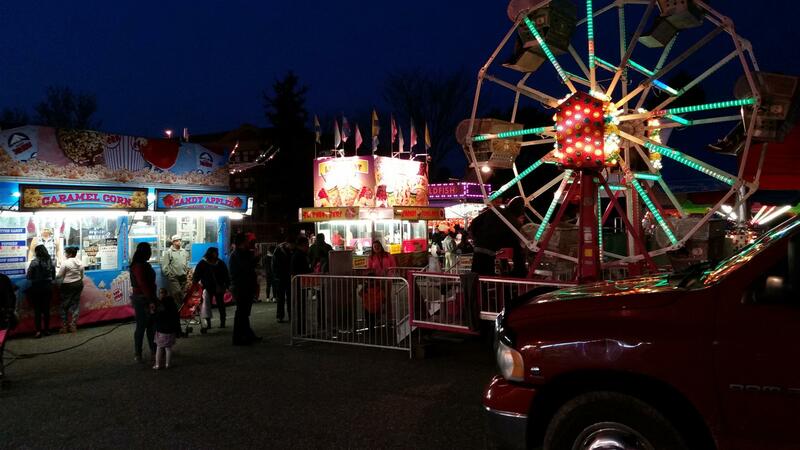 The McDaniel Brothers Shows has for over 15 years presented the Summer Carnival in Haverstraw, New York. It had been sponsored by the Hispanic American Lions Club, but this year the Rotary Club of North Rockland co-sponsored the community event. The rides provided a wonderful variety for children of all ages. They were clean, well lighted, and the employees always set up on time for each day’s opening. Despite the heated weather conditions, each day the employees cleaned up the carnival area (picking up debris) giving the carnival a fresh look each evening of the event. The general appearance of the entire carnival from the rides to the games and food stands was excellent and a wonderful experience for the residents. During the event, the McDaniel Brothers were on-site to handle the set up, operations and safety monitoring throughout the entire Five (5) days. It was a wonderful recreational opportunity for the community and the Rotary Club of North Rockland was grateful for the opportunity to work with the McDANIEL BROTHERS SHOWS. We look forward to next year! To make sure every student in North Rockland is off to a successful start, the Rotary Club of North Rockland is assisting and donating time and money for the 2nd Annual Back-to-School Back-Pack Family Event sponsored by Haverstraw Holiday Meal Committee & Temple Beth Sholom. The Rotary is proud to contribute to the back-pack program for students who are in need of supplies. A high percentage of students in the North Rockland School District are low income. It is often impossible for their parents to buy them the school supplies they should have to start the new school year. The economic downturn has had a tremendous impact on families and in particular to the children. This event is an amazing community event in which the Rotary is extremely proud to be an active participant this year. Spending only a dollar or two you can come away with a whole bag full of school supplies. So you can use those amazing shopping skills to benefit our students and our community if you start now. Children of low income families have many obstacles in their path to success, let us make sure that a lack of school supplies isn’t one of them. 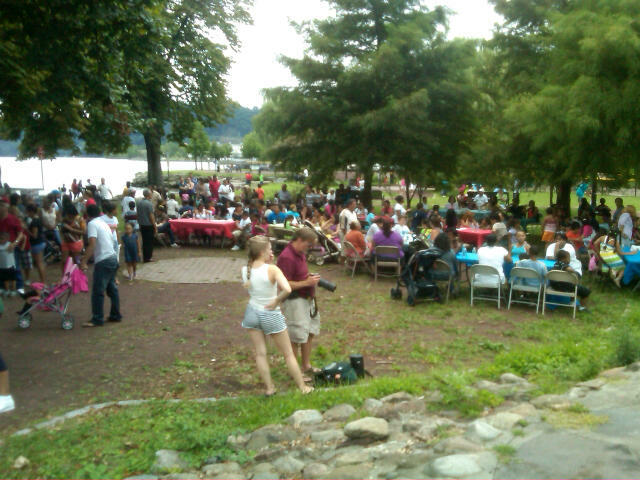 The event will take place at: EMELINE PARK, Sunday, August 19, 2012, 2:00pm - 5:00pm. There will be live music, children's arts & crafts, lunch & much more. On the front page of your directory you will see "JoinRotary@optonline.net. This is an effort to provide information to prospective Rotarians. Ron Chromey will manage this e-mail. Please refer anyone you know that may be interested in joining rotary to Ron and he will take all steps necessary to answer their questions. On Sunday, June 10th, 2012, at 2:00pm the Rotary Club of North Rockland attended the Penguin Rep Theatre in Stony Point New York. The show was "The Hound of the Baskervilles" a Sherlock Holmes mystery. The story is about Sherlock Holmes and Dr. Watson investigating the legend of a supernatural hound. It was an extremely entertaining afternoon and the acting was incredibly good! Shortly before the show, the Rotarians began the afternoon with a wine and cheese fellowship. Thereafter, several of the attendees had dinner at Pasta Cucina, Stony Point, New York. The snacks, show and dinner completed the day and laughter was the theme of the day! Lauren M. Travaglini, daughter of Rotarian Ralph Tavaglini, drove the North Rockland Rotary's stock car down Central Avenue which is a 1,000-foot track. All the stock cars competing in this Soap Box Derby are unpowered and the speed of the car relies completely upon gravity. She participated in two "heats" and did not compete any further because her opponent won. The weather was perfect. Kathy Vandervoort,Ralph Travaglini and Sonia Crannage arrived early to set up for the event providing beverages and snacks under a decorated canopy. Several family members, PDG Carole Tjoa and many rotarians arrived to give support. 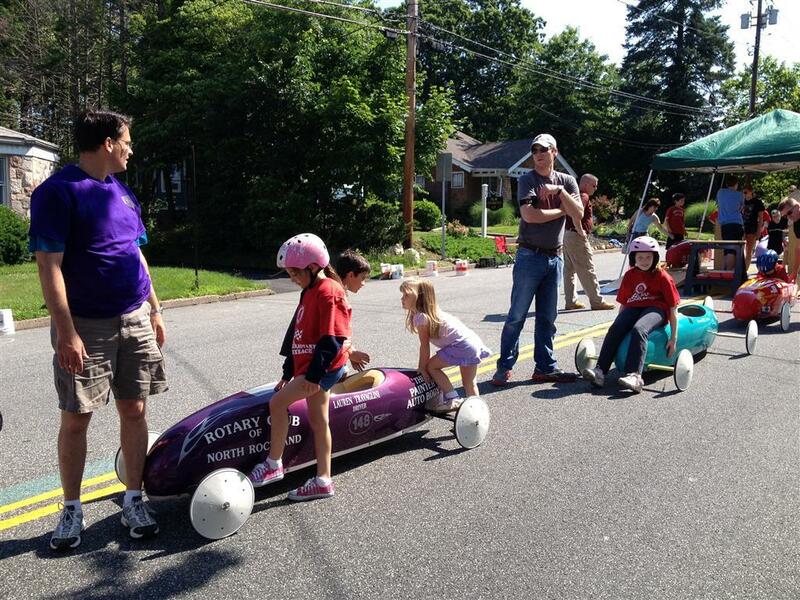 Drew Kessler and two of his children also raced in the Soap Box Derby. All the children had a great time and the support they all received from our club and family was wonderful. North Rockland Rotary Club had many hay bale sponsors and the signs prepared for the event were beautiful. 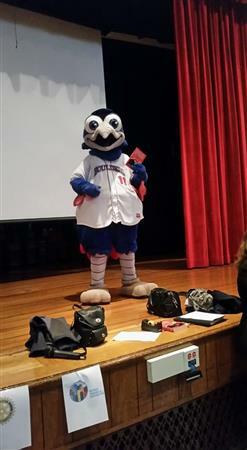 Pearl River Patch and New City Patch covered the event, and Lauren M. Travaglini was a STAR! On Monday, May 28, 2012, at 10:30 a.m. the Rotary Club of North Rockland participated in The Memorial Day Ceremony led by Post 130 Commander, Don Joachim. The ceremony included the WWII Monument Paver Unveiling and our own President, Francis “Bud” Wassmer was the Master of Ceremonies. The ceremony was attended not only by Rotary club members, but many family members and sponsors of the pavers. The unveiling of the pavers at the WWII monument gave me the full meaning of Memorial Day as a solemn day of mourning, a sacred day of remembrance to honor those who paid the ultimate price for our country’s freedoms. It was a very moving ceremony as we watched families honor their loved ones who died protecting and preserving the freedoms we all enjoy. The program included the Pledge of Allegiance, National Anthem, Reading of the Names of Those who made the Ultimate Sacrifice, Ringing of the Bell, Placing of the Wreath, Taps, and the Raising of the Flag to Full Staff. 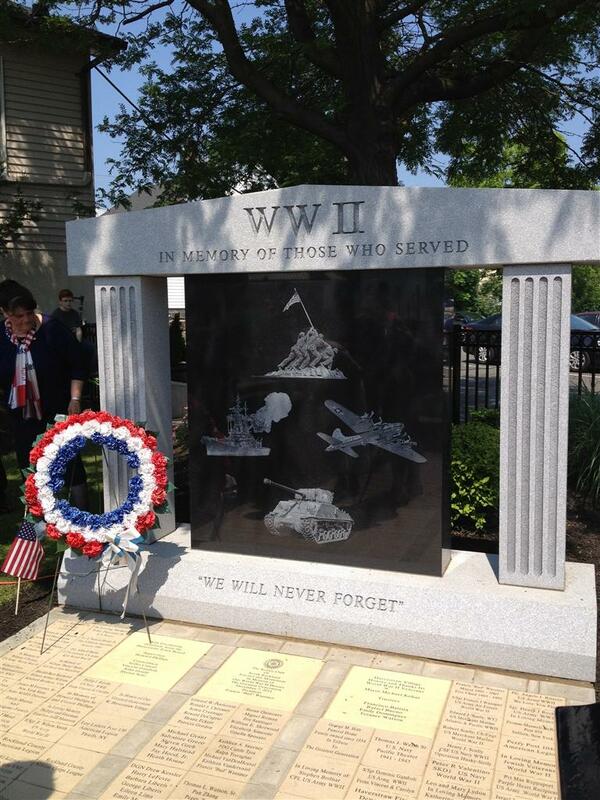 On this special day, the Rotary Club of North Rockland led by its President, “Bud” gave thanks to our Heroes in a very small way by erecting this WWII Monument dedicated to The Greatest Generation. President, Frank (Bud) Wassmer; DGN, Drew Kessler and his wife; Iris Santiago; and Sonia Burgos Crannage attended the District Assembly at the Boces Harriman Campus, Monroe, New York. It was a great day with lots and lots of information. In fact, Iris Santiago, will be making a report at our next luncheon. One of the highlights was the information Iris obtained concerning the newest Avenue of Service, New Generations Service. For the new members, Rotary's commitment to Service Above Self is channeled through Five Avenues of Service and they are the foundation of club activity. The Five Avenues of Service are Club Service, Vocational Service, Community Service, International Service and now the newest New Generations Service. It is through these committees that we serve our community. Finally, Bud and Sonia attended a "Facebook" program...I really do not need to say very much about THAT! Bud and Sonia both agreed that it should have been IRIS attending that meeting. It is the way of the future, but boy it was a futuristic journey for Bud and Sonia. All in all is was a great day of fellowship with Rotarians! 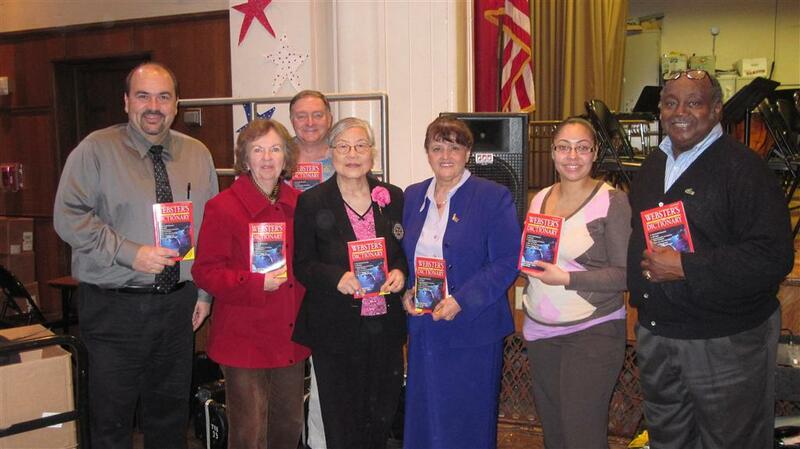 Principal Avi Shelby welcomes North Rockland Rotarians Mary Halstead, Gary Mower, PDG Carole Tjoa, Sonia Crannage, Iris Santiago, and Tom Watson to Haverstraw Middle School, where 200 dictionaries were distributed on December 6.